On Monday evening February 10th 2014, the 10th of Adar I, 5774, the Ponevez 48th Annual West Coast Dinner was held at the Sofitel Los Angeles Hotel. The community was honored by the presence of the Ponevez Yeshiva Batay Avoth President, Harav Eliezer Kahaneman, shlita. The Rosh Hayeshiva is a grandson of Rav Yosef Shlomo Kahaneman zt”l, the guiding force who brought the yeshiva from Europe to Eretz Yisroel. It is almost 50 years since the Ponevez Yeshiva made its first connection with the West Coast Jewish Community. The relationship continued to grow and strengthen over the years and now the visit of Rav Eliezer Kahaneman shlita is looked forward to with great anticipation. The attachment of the Los Angeles Community with Rav Yosef Shlomo Kahaneman zt”l, known as the “Ponovezher Rov”, started with that first visit to Los Angeles many years ago. A consummate fundraiser, the Rosh Hayeshiva created a bond with the many Jews of this city, religious and non-religious alike. He was loved and respected by all of them and to this day, families and relatives continue their support for Ponevez and its institutions. The evening’s MC was Tzvi Fleischmann who welcomed the guests and introduced all the speakers. Rabbi Kalman Topp, Senior Rabbi of Beth Jacob of Beverly Hills, made the presentation of the Kesser Shem Tov Award to Dr. and Mrs. Robert Levine. 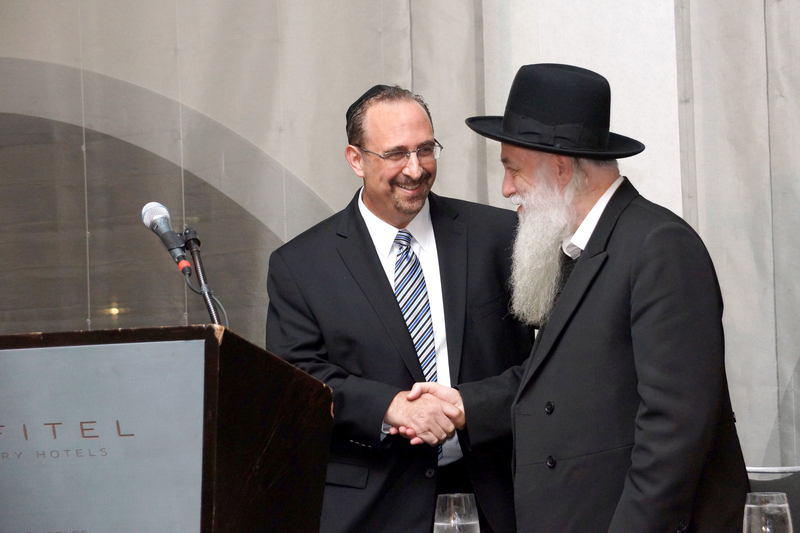 In making the presentation Rabbi Topp told the audience that “ not only is Dr Levine a prominent ophthalmologist, but he and his wife are committed to the torah and its teachings and they truly represent torah and chesed ”. A Hakoras Hatov Award was presented to Mr. and Mrs. Moshe Sarto by Rabbi Yitzchok Summers of Anshe Emes. Among the many good deeds done by the Sarto’s, is the famed Los Angeles Community Email Announcements known as the “Hillygram”. The “Hillygram” provides daily information online of all events and announcements relating to the Los Angeles Community. A Gemillas Chesed Award was presented to Ronit Kashanian (Fallas) and the Kashanian family. A Tzeschem L’Shalom Award was presented to Mr. and Mrs. Gary Dalin and a Special Service Award was presented to Mrs. Nettie Shuken. A video of the Ponovez Yeshiva and its various facilities was shown. The audience got a glimpse of life in the yeshiva past and present. It was an opportunity to see hundreds of yeshiva boys learning in this great citadel of torah. Throughout the evening music entertainment was presented by Naftali Finkel, chazanut from Yaakov Rosenblatt and a special music interlude from Sam Glaser. Sam is a composer, performer and interpreter of Jewish music. He is referred to as one of the top ten Jewish artists in the United States by Moment Magazine. The last of the speakers was Rabbi Jonathan Rosenberg, the Senior Rabbi Shaarey Zedek Congregation, which is the largest Orthodox congregation in the San Fernando Valley region of Los Angeles. The guests got to hear from Harav Eliezer Kahaneman, who thanked those who have stood by the yeshiva all these years.